[Excerpt from the Fall Issue of the TLABC Verdict] – out now! There’s a feeling in the air when summer fades and fall begins… that back-to-school ‘something’ that is crisp and busy and smells like falling leaves and hot apple pie. Warm afternoons turn into cool, dark evenings and calendars fill up again with meetings, fundraising and campaign strategy. Not that summer was all that quiet around here- we had multiple retreats and conferences going on for the TLABC Staff, the Board & Executive, and some of our campaign committees, (albeit with a few vacation days tacked on.) We had staff in Los Angeles and Seattle, Washington, Squamish, the Yukon and Osoyoos, and we’ve been examining our goals and planning for the year ahead, but the work has been strategic and internal and now it’s time for action. I was fortunate to attend a conference in LA this past July and was asked to present to the National Association of Trial Lawyer Executives (NATLE) on behalf of TLABC. The meetings were in conjunction with the American Association of Justice (AAJ) and were also book-ended by the GOP and Democratic National Conventions. It was definitely a busy week in California, and there was an undeniable buzz that distinctly reminded me of my very first AAJ/NATLE trip – pre-US election, 4 years ago. It was the same conference, but in Chicago – just before Obama’s second term. Now, let’s not get it twisted – this particular buzz was not exactly the same. 4 years ago, it felt exciting and hopeful and I was fascinated by the entire business… whereas this time, it simply seemed to stem from fear. Fear is a powerful thing. It’s palpable. You could feel it in the media, as stories broke about even more racism, more crimes of hate and gender, and in the ongoing antics of that man-who-shall-not-be-named. You could feel it in the public perception as they carefully went about their days, avoiding the conversation as often as possible, completely unsure of what is to come. Everyone seemed to be reacting to a series of sometimes silent, but very tangible threats to their society, often with humour, but always in fear. Well, if there’s one thing that I’ve learned from my time at TLABC, is that fear does not fuel change – only passion does. At TLABC, through our PAC fund, we are constantly working against threats to our justice system, and our members remain diligent in monitoring what may be coming down the pipe. We want to make change – to protect our citizens – to strive towards better access to justice. These are no small things. But success lies in our passion and subsequently, our action. I’ve heard time after time, that TLABC was founded by a “small group of renegades” – lawyers who truly believed in justice and in the access of it. These lawyers did not act out of fear, but of concern for their clients and a passion for their practice. As time goes on and more battles arise to be fought, it is imperative that we remember to do the same. There are other groups and organizations who are better suited to predictable action and reaction – TLABC is not one of them. The work continues, not out of fear of the unknown, or of systematic dissolution, but because it is the right thing to do. As an association, we will rise to the challenges ahead and show time and again our commitment to justice. Make a commitment to justice. In a recent series, APB profiled some of the wonderful volunteers who make APB so vital to access to justice in BC. Today’s profiled volunteer is Mosope Fagbongbe, who also happens to be one of our new, engaged members! Mosope has been very interested in becoming more involved with TLABC and we thank her for that – some of you may have met her at the TLABC Holiday Bash at the Vancouver Rowing Club on December 5th, where she had generously volunteered to help us out! Mosope is an exceptional volunteer who commits her time to no less than three of our pro bono programs: the Wills Clinic Project, the Civil Chambers Program and the Summary Legal Advice Program. 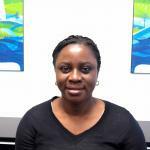 Mosope practiced law in Nigeria briefly before moving to teaching and legal research with a specialty in public law. She earned Masters and Doctoral degrees in Canada, and has worn many hats at different times as a lawyer, researcher, teacher, trainer, human rights activist and advocate. She was a sessional lecturer at UBC Law, and recently qualified to pursue a legal practice in BC. She volunteers with other social justice groups as well as APB, mostly serving vulnerable people like seniors and women in dangerous situations. Mosope’s dedication, hard work and positive attitude make her a highly valued member of our volunteer family.